Unless you are working with outdated data, the majority of users signing up for free email accounts choose Gmail. Yet marketers often complain that the Gmail spam filter and additional “promotions” folders often cause their email’s efforts to have lower engagement rates. User’s typically don’t regularly sift through their spam folder unless they have a good reason to go there. So, today we are going to share some tips on ways you can reduce getting sent to spam. If you want the best chance of not being sent to the Gmail spam filter your recipient needs to add you to their contact list. This signals to Gmail that their users are happy with your content and like communicating with you. However, getting users to add you to their address book is not so simple because it requires them to take additional steps. One quick way to wind up in the Gmail spam filter is by having too many spam complaints. If your complaint rate rises enough Gmail will merely deem all the content, you send not worthy for their users. Send quality content and communicate consistently. Another great idea is to make sure you are utilizing data hygiene such as email verification with Xverify. Not only do our tools make sure the email address exists, but it also helps you flag users who are most likely to generate spam complaints. Double check your email template. Problems with your source code can send you straight to Gmail jail. Make sure you thoroughly test for broken links, and that your email template correctly displays in both desktop and mobile. Often digital marketers are in a hurry to get the campaign out the door and fail to do a double check. No, I’m not saying that you need to support multiple languages, but you do have to be careful of your choice of words. You should be familiar with some of the most popular spam trigger words and make sure you avoid them. Using words such as “Free for Life,” “Click Now,” “Offer Expires Soon,” “No Purchase Required” could land you in the dog house. So watch your words if you want to avoid the Gmail spam filter. Gmail is aware you are going to send marketing campaigns, and that’s fine. The real goal of the spam filter is to give the users what they want and separate the good senders from the bad. Once you start using these tools, you can better track things like your spam rate, IP reputation, and delivery issues. 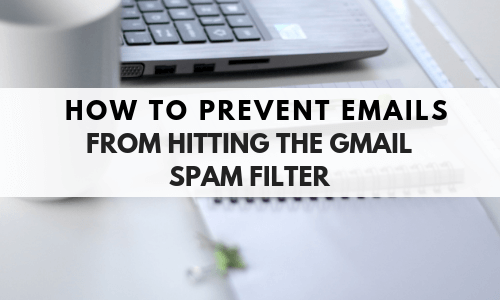 Navigate away from hitting the Gmail spam filter by using Gmail’s own built-in tools. Spam filters are going to continue to be a growing issue for email marketers. They are going to get stronger, and it’s our job to send compelling content to quality data. Make sure you are regularly cleaning up your email list and communicating with users who want to hear from you. Follow the tips above to minimize your risk and get in front of your recipients.